Author(s): Shannon Kelly, Vishal Shahidadpury, Aum Solanki, Vijaykumar Sutariya. Abstract: Age-related macular degeneration (AMD) is one of the leading causes of blindness in the U.S. The inflammation and angiogenesis that are characteristic of age-related macular degeneration (AMD) are caused by an increased expression of vascular endothelial growth factor (VEGF). It has been reported that the hypoxia induced factor 1α (HIF-1α) induces the overexpression of VEGF and other proangiogenic factors. Recent studies have found that Aflibercept (Eylea) suppresses secretion of the inflammatory cytokine, VEGF. Doxorubicin (DOX) has been reported to suppress hypoxia induced factor (HIF). A combined system with the ability to suppress both VEGF and HIF shows potential in the treatment of AMD. 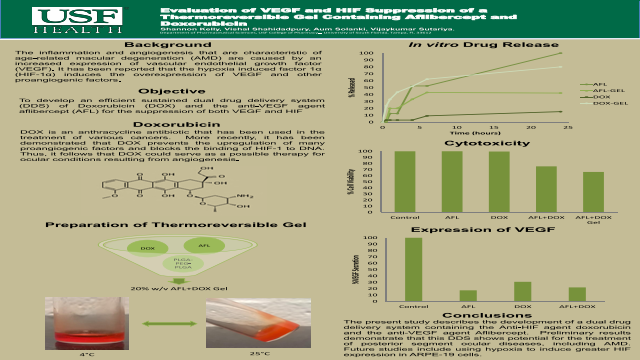 In this study, retinal cells expressing VEGF and HIF were treated with a thermoreversible gel containing DOX and Eylea and the suppression was measured via ELISA. The efficacy of this gel was compared to solutions of each of these drugs.